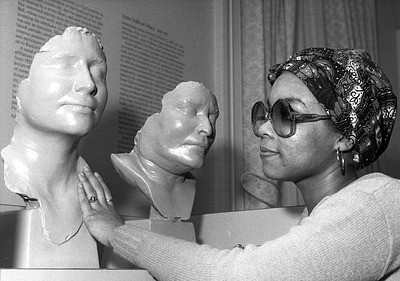 In celebration of Black History Month, we will be highlighting stories of African American women who have uniquely contributed to the Smithsonian’s history. Check back on the blog throughout the month to explore the stories of these remarkable women. Increasing diversity at the Smithsonian took time and persistence. Educators played an important role in this, even when museum collections lacked objects that reflected African American history. Tracy Carpenter was an education aide at the National Portrait Gallery starting in 1976, most likely through a program that recruited students from her school, American University, among others, to gain work experience. As an education aide, Ms. Carpenter would give tours to groups of students and show slides in classroom presentations at schools. Louise Daniel Hutchinson was an African American educator at the National Portrait Gallery a few years prior to Carpenter’s employment and who had worked to identify black history that could be discussed during museum tours. Carpenter was directly involved with the legacy of Ms. Hutchinson’s work, particularly through activities about the legacy of John Brown. He was an abolitionist famous for attempting to initiate an armed slave revolt by seizing the United States arsenal at Harper’s Ferry, West Virginia. His trial and hanging inflamed attitudes and discussions regarding slavery in the country that led to the Civil War. Louise Hutchinson had done research about his story, and Tracy Carpenter later conducted a mock trial for John Brown with schoolchildren at the museum. This was a wonderful example of using the limited resources of a portrait gallery that highlighted white men in its busts and paintings, to complicate these representations with history of African Americans. It was also invaluable for local Washington, D.C., children to hear African American history. 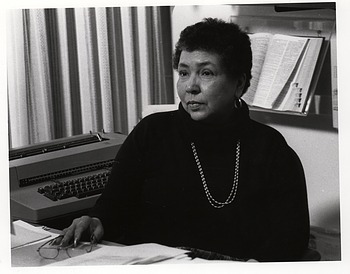 Another major figure in education at the Smithsonian was Amina Dickerson, Director of Education at the National Museum of African Art from 1974 to 1982. Her first initiative after arriving at the museum was establishing African Heritage Month. 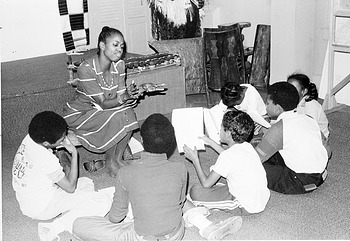 Through this work she cultivated relationships with schools in Washington, D.C., and invited drummers, artists, poets, and many other performers to help children and adults alike get a better understanding of African culture and see their own culture represented as important enough to be taught in schools and shared in museums. Dickerson herself was a member of the Museum of African Art Musical Ensemble, a group that would perform at many events at the museum. The museum also screened films about everything from figures like Frederick Douglass and Martin Luther King, Jr., to African music and black pride. All of the activities Amina Dickerson put together for this program informed her work in the rest of her time with the Smithsonian. In addition, the education department focused on making its programs more accessible. This included working with the elderly, hospitals, and the deaf community through a partnership with the Model Secondary School for the Deaf at Gallaudet College. As educators these women also had direct a impact on the stories communicated by docents and at programs for their respective museums. This was crucial in the National Portrait Gallery, where most materials left little room for telling black history, as well as at the National Museum of African Art, which took its messages to public spheres that needed to see diversity. In going to both of these museums, African American children would be able to see their own history represented, and white children had the opportunity to develop cultural sensitivity and respect. Louise Hutchinson and Tracy Carpenter took a place where the collections were not diverse and challenged the messages by making an educational script relate collections to African American history. Amina Dickerson took a museum that celebrated African culture and made these materials available to other places of education with schools. Education helps define what we believe and how we see ourselves in relation to other Americans, and these women made African and African American history and culture part of a larger discussion for children and visitors to the Smithsonian.